Google might be stunting your online experience. Today, 75% of desktop and laptop searches pass through the world’s most popular search engine. Google’s next closest competitor, the Chinese search giant Baidu, accounts for just 12%. Like compasses, search engines are useful tools, guiding us through the oceans of online information. But unlike compasses, they are often dynamic and personalized. Search engines gather data and learn from each input. While that customized aspect makes our searches more efficient, it can subtly undermine our autonomy. On the surface, that may seem innocuous. But if our options are algorithmically curated, that removes our choice and diminishes our exposure to challenging viewpoints. Weinberg believes filtered searches engines like Google create echo chambers and further polarize society. Through clicks, we construct our own barriers, and eventually, we might become too blind to know they exist. Alternative search engines like DuckDuckGo and Qwant—a French company—are growing in popularity. Because these tools don’t track users, they are less precise than Google, but they help users avoid “filter bubbles” that limit what they see. 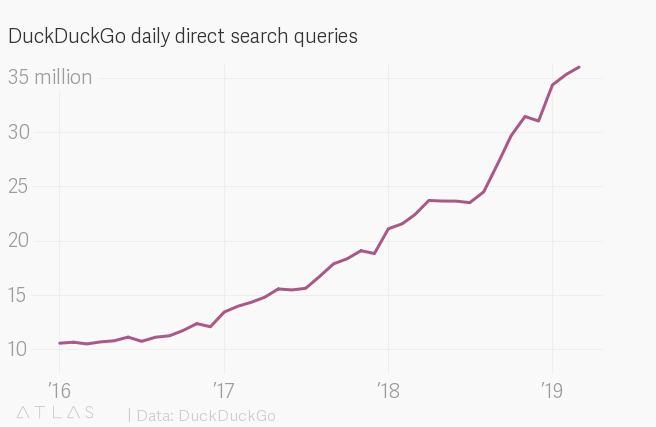 DuckDuckGo recently surpassed 35 million daily direct search queries. Google, meanwhile, processes 5.5 billion searches per day. Obviously, that’s a massive gap, but the market for privacy-preserving search is growing worldwide. Google’s advertising machine is another reason to consider other search engines. By studying our search behavior, products are promoted to us by advertisers who have a direct line to our most intimate thoughts and desires. Our online profiles are caricatures of our true selves, but in a very real way, our searches can shape who we become. Advertisers are interjecting themselves, almost invisibly, into this information exchange. We often treat Google like our personal encyclopedia. The search engine’s sleek design can make us forget that it’s not a private getaway or even an extension of ourselves. Alternative search engines, though, do not fit seamlessly into our digital lives. That honesty is refreshing and it helps remind a person of the physical-digital divide. If changing your default search engine seems too inconvenient, you can opt out of Google’s personalization, revoking access to search and location histories. Although it’s a mild annoyance, it can help us acknowledge the blinders Google has erected around our queries. About six months ago, I created a new Google account, so my username would sound more professional. As I used the new profile, I was amazed by how little Google knew about the “new” me. YouTube had forgotten my love of basketball and ice hockey highlights. Instead, I saw recommendations for Vine compilations and prank videos. On search, I no longer saw advertisements for cryptocurrency conferences. Making a new profile showed me that I could recreate myself and have an entirely different online experience. That was unsettling, but eye-opening. By changing your privacy and advertising settings, you can climb out of Google’s digital silo to encounter the real and unfiltered world. It might require more effort to find what you’re looking for—but at least you’ll know that you’re doing it on your own terms.